I am interested in 31 Possession Cres, Brampton, ON. 31 Possession Cres is a - square foot House for sale in Brampton, ON L6P4K3. It has 4 beds, 4 baths and was listed on Ovlix.com since April 15, 2019 by Re/max Realty Specialists Inc. for $1,549,000. Listing agent: Sukhvinder Singh. The average price for similar 31 Possession Cres real estate listings - $968,744 which is 13% higher than $840,311 for Brampton, and 2% lower than $988,482 for Ontario. 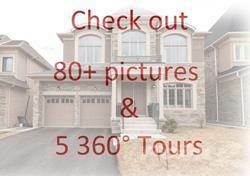 Comparable nearby homes are: 19 Upper Ridge Cres, 16 Royal Links Circ, 21 John Carroll Dr, Lot 159 9 Ezra Cres, 5+3 Bedrooms Home At Constance St. What's near 31 Possession Cres, Brampton L6P: Goreway Power Station, Cardinal Ambrozic Catholic Secondary School, Turtle Jack's Muskoka Grill & Lounge, 10 Peel Centre Drive, Claireville Conservation Area, Claireville, Brampton, Brampton Soccer Centre, Chinguacousy Park, Sandalwood Heights Secondary School.